Create alerts on your brand, your competitors, your industry and monitor online news, blogs, review sites, forums and the web in general. Protect your brand and be informed when new articles mentioning you are published online. Measure the volume of conversations around your brand and follow how your online reputation is evolving. 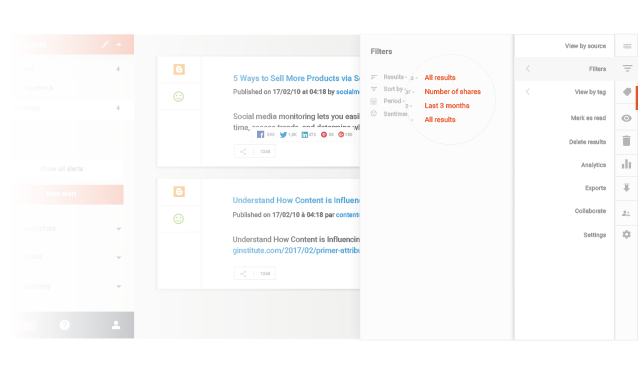 Easily filter the articles mentioning you by source (online news, blogs, forums, review sites) and sentiment. Quickly identify publications mentioning you in a positive or negative way. Get a clear picture of the main trends. If we’re talking about your brand on the web, are these conversations happening on blogs, forums, Twitter …? Our dashboards will help you understand key trends and know where your online presence is strong or where you should focus more of your efforts. 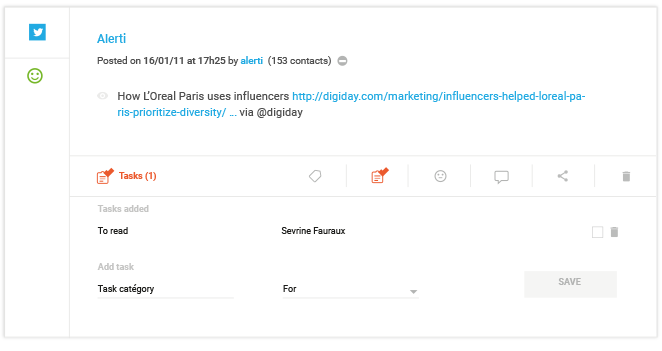 Filter the articles mentioning your brand by their number of shares on social networks and identify the most influential websites. The more influence a website has the more shares its articles will get on social media. 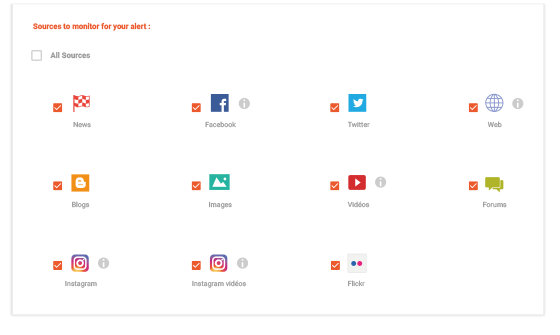 Share your alerts with your collaborators so they can access the data from their own account as well as the notifications. Assign tasks to your team and follow the progress made. 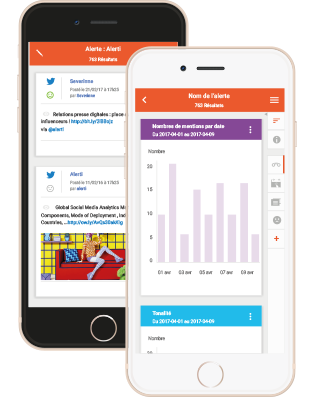 Never miss important conversations and access your alerts from everywhere with our mobile apps. Tag and annotate results, edit your alerts. Everything stays in sync with your alerti account.